Random And Some: "Some one fact may be the keynote of success"
Nobody should be allowed to have anything to do with advertising until he has read this book seven times. From there on out, the article was pretty much a bonus. I ordered the book the same evening and tore through it. In just 21 short chapters, Mr. Hopkins demonstrates the importance of testing and measuring in every aspect of advertising. He establishes and outlines several laws through which the advertising field becomes a certainty instead of a gamble. No stone is left unturnt, as Hopkins tackles several topics, including, but not limited to, salesmanship, psychology, storytelling, art, and strategy. 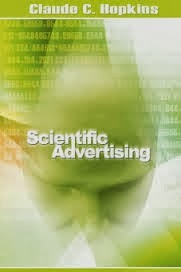 Though you could argue that advertising has come a long way since the days of mail order advertising, the laws in Scientific Advertising still apply in the present age. Sadly, a lot of advertising nowadays is based on hunches and guesses, even with a boatload of data available to advertisers and marketers, and so I think a lot of industry professionals could benefit a great deal from checking out this landmark publication. Ad-writers abandon their posts. They forget they are salesmen and try to be performers. Instead of sales, they seek applause. In my humble opinion, modern advertising has become too self-congratularory and often pushing too hard to be creative or artsy or shocking just for the sake of, well, being creative and artsy and shocking. I understand that winning a Cannes Lion is a big deal, but to me it appears that many ad agencies nowadays are producing work solely for the purpose of winning prizes. I have a gut feeling that Mr. Hopkins would not like it one bit.